The first post-Confederation treaty, Treaty One, is concluded in August 1871 and covers Manitoba as it existed then. Treaty Two is concluded a few weeks later and covers areas needed for expansion and settlement in the west and north of the Province. British Columbia enters Confederation on the understanding that construction of the east-west railway will begin in two years and will be completed in ten. Look at a typed transcript of the Treaties 1 and 2 text. Initiated by Indians and Métis concerned about the declining numbers of animals which provided them with a living. Treaty 4 covers present-day southern Saskatchewan. Provisional boundary set in northern Ontario. Look at a typed transcript of the Treaties Four text. Look at a typed transcript of the Treaties Five text. The negotiation of this treaty took place during a difficult period for the Plains Cree, who were suffering from the rapid decline of the buffalo. The documents indicate that their concerns included medical care and relief in case of need. Look at a typed transcript of the Treaties Six text. The first of the northern treaties covered an area of 324,900 sq miles and represents the most geographically extensive treaty activity undertaken. It comprises what is now the northern half of Alberta, the northeast quarter of British Columbia, the northwest corner of Saskatchewan, and the area south of Hay River and Great Slave Lake in the Northwest Territories. Look at a typed transcript of the Treaties Eight text. 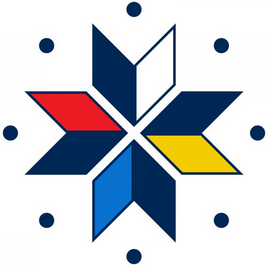 Covers 220,000 square kilometres of northern Saskatchewan and Alberta. 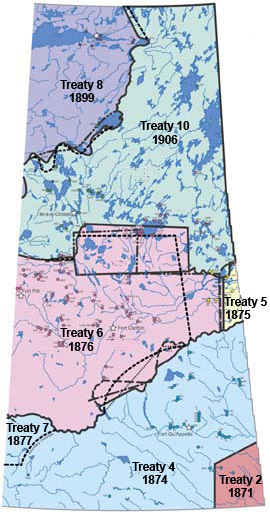 Unlike the land in southern Saskatchewan, the Treaty 10 lands were deemed unsuitable for agriculture and so the federal government did not respond to demands from the region's Native people for a treaty until the early 20th century, when the mixed-blood people of northern Saskatchewan began to demand compensation for loss of aboriginal rights and the Provinces of Saskatchewan and Alberta had been created. Look at a typed transcript of the Treaties Ten text.